With the bulky yarn and giant hook, it’s a pretty quick project. The finished size is about 26“x30”. With “sand” colour yarn, ch 31. Row 1: sc in 2nd ch from hook, sc in every ch across, turn (30 sc). Row 2: ch 1 (does not count as sc), sc in each sc across, turn. Repeat row 2 until piece is about 22″ from beginning. Row 1: ch 1, 2 sc tog, sc in each sc across until 2 sc left in row, 2 sc tog, turn. Row 2: repeat row 1 of bread top shaping. Row 3: ch 1, 2 sc tog, sc in next 9 sc, 2 sc tog, turn. Row 4: ch 1, 2 sc tog twice, sc in each sc until 4 sc left in row, 2 sc tog twice, turn. Row 5: ch 1, skip first sc, sc in next 4 sc, 2 sc tog, turn. Row 6: ch 1, skip first sc, 3 sc tog, fasten off, weave in ends. Attach yarn to middle of bread top shaping at row 3, repeat rows 3–6 for the other side of bread top. Attached “taupe” colour yarn to any stitch at the bottom edge of toast, ch 1 (does not count as sc), sc around toast evenly (1 sc in each sc at bottom edge and bread top, 1 sc in each row‐end on the sides, making 2 sc in each corner, and making 3 sc tog in the middle of bread top where it dips in), sl st in first sc to finish round. Crochet 2 more times around toast, fasten off, weave in ends. With “taupe”, 10 hdc in magic ring, sl st in first hdc to complete round, fasten off, leave a long tail for sewing. With “taupe” and 6 mm hook, ch 9, fasten off, leave a long tail for sewing. Crochet a rectangle about 3“x4”. Number of stitches and rows will depend on the yarn you use. When fastening off, leave a long tail for sewing. Sew eyes, smile and butter pat onto toast with tapestry needle. When sewing on butter pat, I tucked in bits of the bottom edge so it looks like it’s melting. “Toasty”.…. I see what you did there. That is the most darling thing I’ve seen in a very long time. I wish I had imagined this pattern or seen it 6 years ago. I have a little niece (now 8) but when she was about 2 she LOVED LOVED LOVED toast and this would have made her very happy. Perhaps its not too late. Thanks for sharing your cute pattern with us! Is it possible to enlarge the pattern with regular yarn for a throw size? I love toast and would love to make one for myself. Maybe twice the size. I’m new at crochet so any help at all would be appreciated. I could actually do this as therapy as I am a disabled veteran. Hi Susan, thank you for your interest in my pattern! You can probably enlarge most of the toast pretty easily, just crochet a foundation chain as wide as you like, then dc in each stitch until desired length. 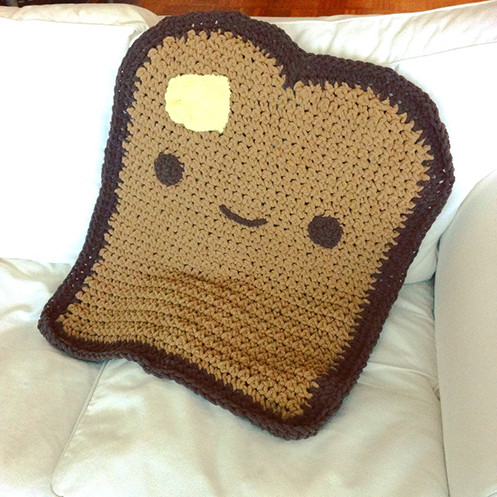 It would be difficult to adjust the pattern to shape the bread top though, I’m not able to create a pattern for that without actually trying to crochet it, and I probably won’t be able to do that any time soon… may I suggest making a square piece of toast? That way, you can just crochet a square as large as you like, then crochet a border with brown yarn, and add the smile and butter pat. Hope this helps! Thanks so much for sharing this cute pattern! I just made one using regular yarn, Red Heart beige and cafe latte. Used K hook so maybe a bit too stretchy. Will try smaller hook next time. 36 by 40 inches. Didn’t do a butter pat but still pretty cute. Made it to donate to a hospital that gives lap blankets to patients in hospice care. hi Shelly! that’s so awesome! thanks so much for giving the pattern a try and donating it too — thank you for spreading joy! best wishes for the new year! Omg, I love this so much. I’ll have to make this someday when I can justify owning such a thing. I made one for my new granddaughter and I’m going to make another one, only larger, for on the couch! I just round the top off like the pattern says, I just do more rows. I am in love with this pattern! I just made my 3rd one! This one is a grape jelly one and it’s for my.… *ahem* GREAT granddaughter due in October!!! Thank you for this AWESOME pattern!!! Wow! I’m so happy you like the pattern! grape jelly is an excellent idea! :D Congrats on the new addition to your family! Is there a way you could do a knitting pattern or direct me to one? 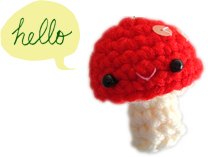 Me gusto mucho el crochet de pan tostado , pero me gustaría saber si por favor si me puede mandar las indicaciones y el patrón en español . 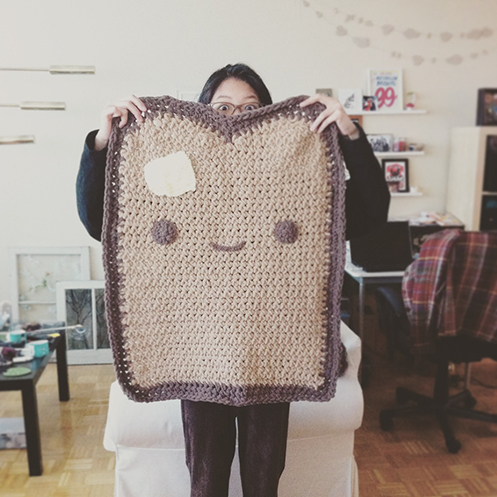 Hi Maria Teresa, thanks so much for visiting my blog and I’m glad you like the toast blanket. Unfortunately I don’t have the skills or means to translate the pattern into Spanish at this time. So sorry about that! Forgot to sign up for follow‐up comments! Hi Debbie, thanks for giving my pattern a try! I did a quick check and according to Lion Brand Yarn, 15mm hook is size Q. Happy crocheting! Okay got it. I was using my loooong tail to go beyond the dark brown into the tan. Thanks, I will try that method. I made this in a larger size. I doubled the chain to 60 stitches. It took about 2.5 balls of the sand colored yarn and maybe .5 of the taupe. It turned out really cute! Going to try and make one for myself! Thanks for visiting Jackie! I don’t usually make videos, hope the written pattern is sufficient! If you have any questions or need clarifications about the pattern, please feel free to leave a comment and I’ll try my best to help! Happy crocheting! If you have any questions feel free to contact me! Can I make this to sell? Yes, as long as you credit my blog when you sell the finished product. Thank you for visiting! thanks Heather! it is written in US crochet terminology. thank you for visiting! Was the yarn you used the small or large balls? Thank you! This blanket is so cute! I’ve had this on my Pinterest for ages and was hoping I could find the pattern, so I just searched and found your page. I can’t wait to make it for my sister‐in‐law, who loves bread and all things carbs! haha thanks Wendy! :D i did think about making a fried‐egg‐shaped pillow! What size hook did you use for the toast? When you say giant hook do you mean like a 10mm, or one of those actual huge bamboo hooks they sell at Michaels? Thanks for visiting, Airi! The hook sizes used in this blanket is listed under “what I used” in the post — 15 mm hook for the blanket, and 6 mm hook for crocheting the eyes and smile. Hi! I am pretty experiences with crocheted and patterns, etc. For some reason I absolutely cannot get the top of my toast to look right. It either bunches up or my crust tops are more like peaks. Lol. Any advice? I’m using the correct hook size, etc and am dying to make this. hmmm… I’m really not sure why it bunches up! So sorry to hear that this is happening! Maybe it has to do with tension? I’m really not sure what can help without being able to see/feel the piece. So sorry! Hope it works out eventually! thanks for visiting Vanessa! yes, 2 sc tog is a normal decrease, you would decrease one stitch. happy crocheting! is there anyway that this can be made into an adult blanket? hello! thank you for visiting! the blanket may be made in larger size by adding more stitches in the foundation chain and more rows as you crochet along, but there would be quite a bit of modifications at the top, and I haven’t had the chance to figure that out yet. I think some folks on Ravelry might have done it and shared tips, so perhaps checking out the Ravelry project pages for the toasty blanket would help! happy crocheting! I made an adult version for a friend of mine! I can’t remembee the exact measurements but i believe i used 3 balls of yarn for the main toast then less than 1 for the crust. I want to say i doubled the chain to begin and then for the top i did everything the same just doubled if that makes sense. It may have been double plus half. It was pretty big!